Since 1993, Caring Medical Regenerative Medicine Clinics (CMRMC) has successfully treated the symptomology of Ehlers-Danlos syndrome, hypermobility type (hEDS) using natural holistic interventions including Prolotherapy, diet modification, herbal remedies and others. Part of the reason for our success with these cases is because we fully understand that you cannot put EDS patients with painful hypermobility in the same pain management system as all other pain patients! Yet, EDS patients with painful hypermobility are regularly dismissed or have to wait months to see doctors who still leave them with the same options of braces and wheelchairs, pain pills, physical therapy, and emotional/mental supportive care. Patients are suffering needlessly! Trying to do their own research, they often read so much hopeless information about the crippling effects of EDS that they themselves believe that there is nothing that can be done to actually strengthen/tighten their loose ligaments. From a Prolotherapist’s perspective, this is one of the saddest and frustrating myths about EDS! A myth that we continue to disprove! We believe a pain cure for EDS is worth fighting for! Our motto, Hope Practiced Here, is fully embodied through our work with EDS patients. If you suspect you have EDS or have been diagnosed with EDS or severe joint hypermobility, we want to help you resolve the chronic joint pain and instability that accompanies your condition! Few doctors or health care providers receive any education on EDS. Very few doctors or health care providers are experts in joint instability, the actual medical condition that causes most of the symptoms of EDS. Almost no doctors or healthcare providers that treat EDS patients are experts on the natural approaches, including Prolotherapy, to resolve the EDS symptoms. Patients with EDS often have a hard time finding a place where they can get a proper diagnosis and then have a health care team equipped to help them resolve the myriad of symptoms that can accompany this disorder. According to the EDS societies, “What’s important is getting the proper diagnosis and treatment- not the label.” Our Caring Medical team could not agree more. Focusing on the label does not help the patient as much as focusing on finding successful treatment options! Chronic pain in EDS is highly prevalent and associated with regular use of analgesics (pain pills). 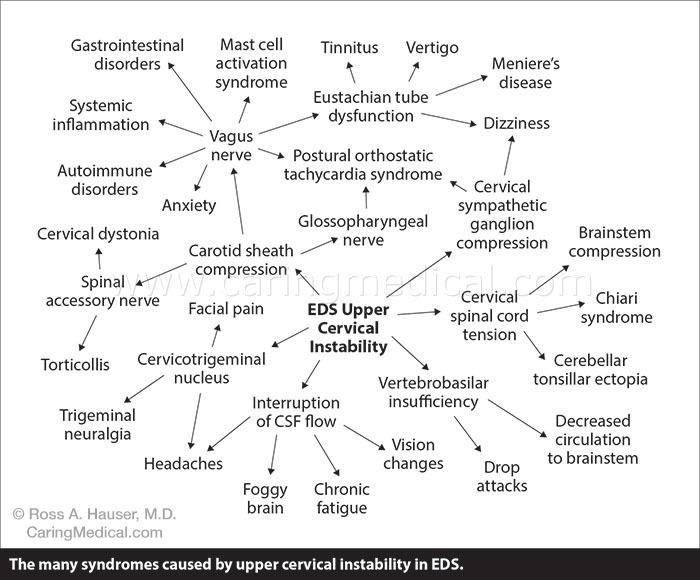 Pain is more prevalent and more severe in the hypermobility subtype of EDS. Pain severity is correlated with hypermobility, dislocations, and previous surgery. Pain is correlated with low nocturnal sleep quality. Pain contributes to functional impairment in daily life, independent of the level of fatigue. EDS is often a progressive disorder, especially when a joint becomes unstable. With smartphone and computer use, certain parts of everyone’s anatomy, especially the neck, are undergoing forces never before seen in human history. 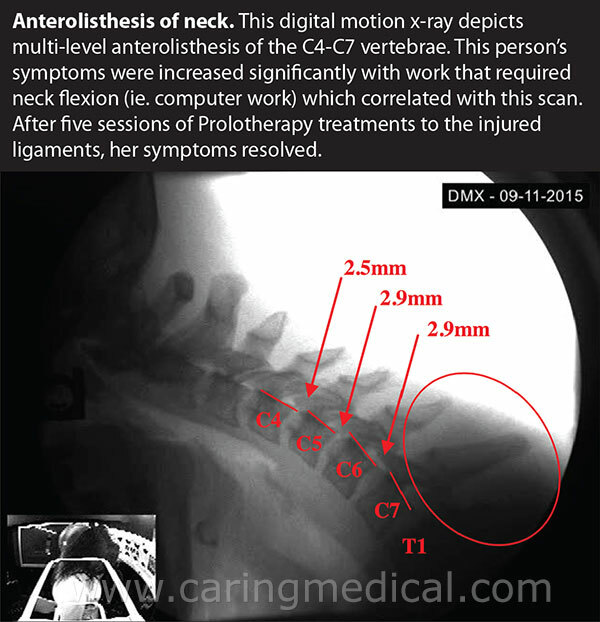 Cervical instability, the most disabling of all the instabilities that occur with EDS, can not only cause severe neck pain, dizziness, vertigo, migraine headaches, but also some of the more devasting dysautonomias seen with EDS including POTS (postural orthostatic tachycardia syndrome) and MCAS (mast cell activation syndrome). Since joint instabilities are a progressive disorder, it is imperative that early recognition of these conditions and then appropriate treatments be given that can resolve the instabilities. The easiest way to understand how EDS disables a person is to consider joint instability like two cabinet doors that are hitting at the center. 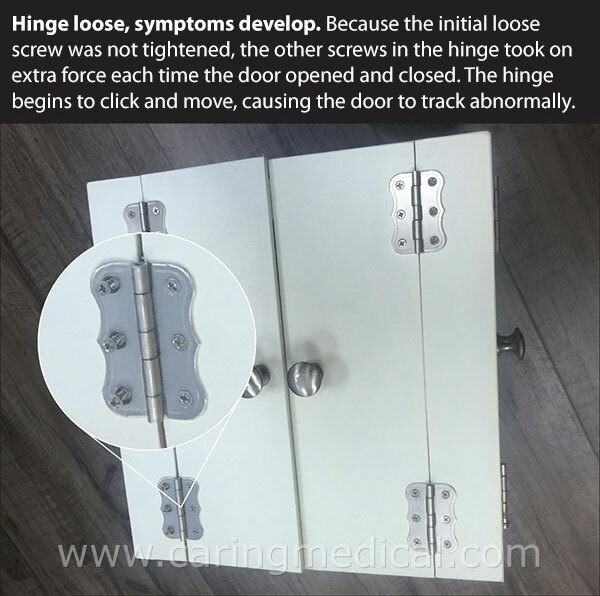 This occurs because the hinge(s) on one of the doors is loose. The only curative solution is to get a screwdriver and tighten the screws in order to secure the hinge. Otherwise, with continued use, it will sublux or loosen more, and damage the cabinet doors even further. Moving a door with a loose hinge, thus, loosens it even more. When a person with EDS has an unstable elbow and continues to use the elbow, not only does that joint become more unstable but, eventually, it will cause the wrist and shoulder to become unstable. Joint instability means the ligaments holding the adjacent bones are too weak or injured to do it, so the bones move excessively (sublux), compress local nerves, and injure not only the intrinsic structures of the joint (such as the cartilage) but all the structures around the joint (including ligaments and tendons). 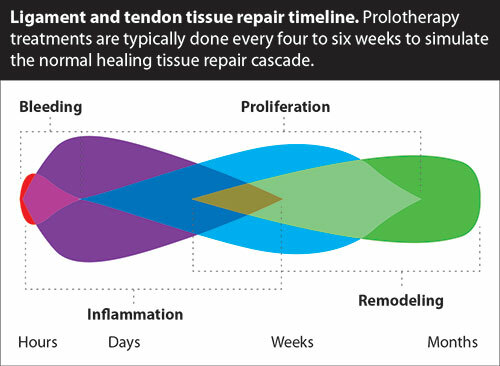 To stop the process, Prolotherapy needs to be started. It is the only treatment designed to stimulate the repair of all the injured structures, not only in the primary joint affected but also in the adjacent joints. Surgery for joint instability is often not successful in EDS because seldom is just one joint involved, and the connective tissue in EDS is not normal which is necessary to have more optimal surgical outcomes! It is well recognized that up to 5% of the general population has a genetic form of joint hypermobility, it is likely a high percentage of these people actually has EDS.3,4 There are currently few places where people can go to get the diagnosis of EDS, as so few physicians and health care providers are trained on the disorder, let alone knowledgeable about the new criteria. Caring Medical clinicians can make the diagnosis for patients as well as treat the resulting symptoms with natural approaches, including Prolotherapy, to potentially resolve the symptoms, versus manage them. Since 80-90% of EDS patients have the hypermobility subtype (hEDS), the Beighton Score is the criterion to document generalized joint hypermobility by physical examination. Can you now, or could you ever touch your hands flat on the floor without bending your knees? Can you now or could you ever bend your thumb to touch your forearm? As a child, could you amuse your friends by contorting your body into strange shapes or could you do the splits? Is your arm span-to-height ratio > 05? Did you have a close family member (first-degree relative) that meets the current criteria for hypermobility EDS? Do you have musculoskeletal pain in 2 or more limbs, recurring daily for at least 3 months? Have you suffered from widespread pain for > 3 months? Do you have recurrent joint dislocations or frank joint instability, in the absence of trauma? Currently, common EDS multi-system manifestations such as POTS (postural orthostatic tachycardia syndrome), GI (gastrointestinal, malabsorption, and others), and MCAS (mast cell activation syndrome) are not part of the hEDS criterion, though it well recognized that these conditions can occur. 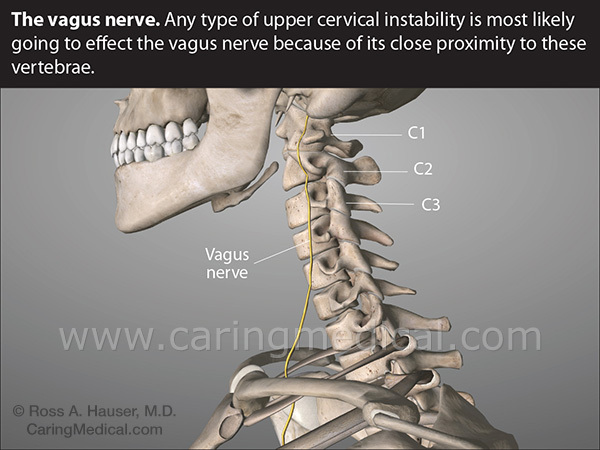 Caring Medical is one of the main centers helping to prove that the cervical instability component of hEDS is the main culprit for these conditions. EDS manifestations, especially joint instability, if not addressed early can lead to progressive daily disabling pain.8, 9 While no cure has yet has been found for the underlying collagen defect that leads to the various subtypes of EDS, the joint instability, joint dislocations, subluxations, progressive joint degeneration and disabling pain can be successfully treated with Prolotherapy.9 Since 1993, Caring Medical has been utilizing Prolotherapy in the treatment of the joint instabilities, dislocations, subluxations and degeneration in its EDS patients successfully. Caring Medical has some patients who have not had joint subluxations or dislocations in over 10 years since their last Prolotherapy session for that joint! Most people are not aware that the ligament laxity caused by the EDS and injury causes destructive joint forces to occur. If left unchecked, the progressive joint deterioration with it! To stop the joint degeneration, the ligaments need to be tightened and the joint stabilized. Prolotherapy injections to the areas where the ligaments attach to the bone (fibro-osseous junction) accomplish this.9-13 Prolotherapy initiates the normal wound healing cascade to start the ligament and joint repair process. Each Prolotherapy treatment builds upon itself, causing ligaments to tighten and joints to stabilize. Prolotherapy treatments are continued until a person is back to full activities, with zero or minimal symptoms, and the joint stabilized. The estimated number of visits is discussed at the first visit, based on the physical exam and medical history findings. The most important and serious of the joint instabilities caused by EDS to recognize in our opinion is cervical (neck) instability. Most people with EDS are unaware that cervical instability can negatively affect the body by blocking cerebrospinal fluid flow, impinge on the vertebral artery, disrupt vagus nerve input and output, hamper the body’s ability to have moment-to-moment accurate control of blood pressure and a host of other harmful effects. Besides POTS and MCAS, cervical instability can cause a host of “diagnoses,” syndromes and symptoms. 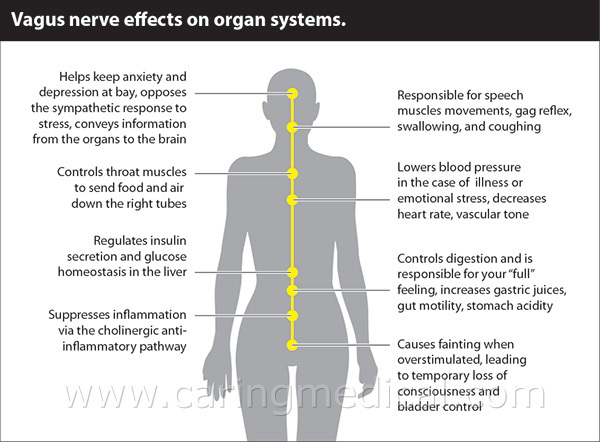 Caring Medical desires to get to the root cause of the EDS symptoms, not just manage them. While there are times that a patient will need some hormone to increase blood pressure affected by POTS, Caring Medical practitioners use a holistic natural approach to healing as much as possible. This is especially important for children and teenagers who are in the growing phase of life. The human body has a tremendous capacity to regenerate and heal itself when given the right food, nutrients, emotional status (peaceful, joyful) and safety (caring, loving, environment). Can joint instability in hEDS be objectively measured? 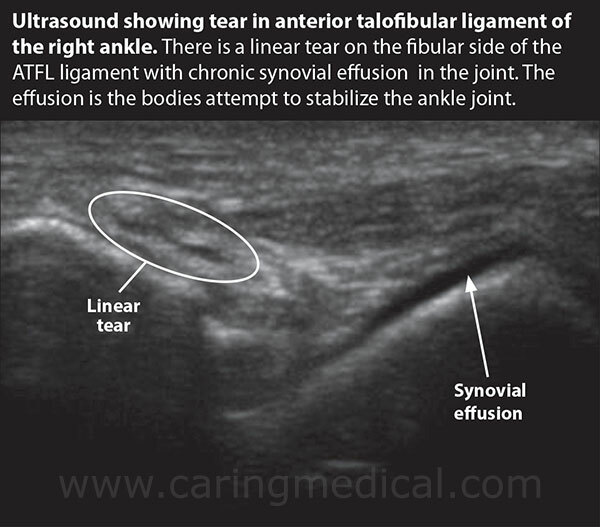 Joint instabilities can be objectively documented with motion ultrasound and digital imaging (fluoroscopy). Peripheral joints are typically examined under ultrasound and the amount of joint instability recorded, measured and documented. As the patient is treated with Prolotherapy, the improvement in the joint stability can also be objectively measured. Treatment is normally continued until joint stability has been restored. Joint instability in the spine is documented through digital motion imaging (fluoroscopy). Typically when a patient is scanned on the first visit, instabilities at multiple levels are found. Documenting where the instabilities are located. Verifying if a patient is a Prolotherapy candidate (versus a surgical candidate). Establishing the severity of the instability. Demonstrating the instability to the patient, their family, and their health providers. Assisting in key decision making including whether the instability is so severe that bracing or curbing of certain activities is necessary. Validating that the Prolotherapy treatments are working as the patient is re-scanned (mini-scan) after every two visits. Confirming joint stabilization so the patient can be discharged. Joint instability can be objectively measured and treatment efficacy validated. 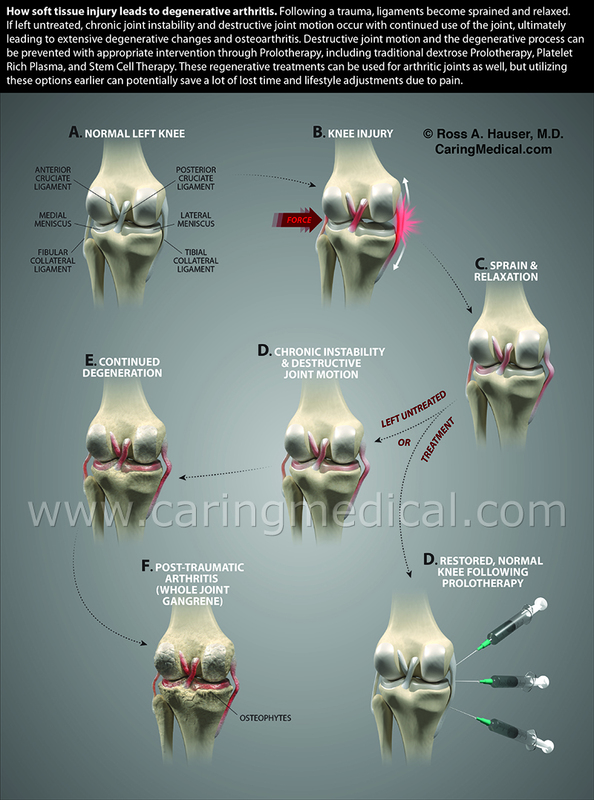 These are key components of the Prolotherapy regimen at Caring Medical. Our specialists would love to help you relieve pain and improve your joint stability, whether you need an official evaluation for EDS and diagnosis, or if you have already been to 10+ providers, and want to see if you are a good candidate for Prolotherapy. 1Voermans NC, van Alfen N, Pillen S, et al. Neuromuscular involvement in various types of Ehlers-Danlos Syndrome. Ann Neurol. 2009;65(6):687-97. 2Voermans NC, Knoop H, Bleijenberg G, van Engelen BG. Pain in Ehlers-Danlos Syndrome is common, severe, and associated with functional impairment. J Pain Symptom Manage. 2010;40(3):370-8. 3Gedalia A. Joint hypermopbility in pediatric practice-a review. Journal of Rheumatology. 1993;20:317-374. 4Kumar B, Lenert P. Joint hypermobility syndrome: recognizing a commonly overlooked cause of chronic pain. The American Journal of Medicine. 2017;130:640-647. 5Camerota F, Castoria M, Celletti C. Heart rate, conduction and ultrasound abnormalities in adults with joint hypermobility syndrome/Ehlers-Danlos syndrome, hypermobility type. Clinical Rheumatology. 2014;33:981-987. 6De Wandele I, Rombaut L, De Backer T. Orthostatic intolerance and fatigue in the hypermobility type of Ehlers-Danlos syndrome. Rheumatology. 2016;55:1412-1420. 7Gazit Y, Jacob G, Grahame R. Ehlers-Danlos syndrome hypermobility type: a much neglected muyltisystematic disorder. Rambam Maimonides Medical Journal. 2016;7:e0034. Pg 1-9. 8Tinkle B, Castori M, Berglund B. Hypermobility Ehlers-Danlos syndrome: clinical description and natural history. American Journal of Medical Genetics Part C: Seminars in Medical Genetics. 2017;175:48-69. 9Hauser RA, Phillips HA. Treatment of joint hypermobility syndrome, including Ehlers-Danlos syndrome, with Hackett-Hemwall Prolotherapy. Journal of Prolotherapy. 2011;3:612-629. 10Hackett G. Joint stabilization: an experimental, histologic study with comments on the clinical application in ligament proliferation. American Journal of Surgery. 1955;89:968-973. 11Hauser RA, Hauser MA. Prolo Your Pain Away! Curing Chronic Pain with Prolotherapy.4th ed. Caring Medical Regenerative Medicine Clinics, Oak Park, 2017. 12Steilen D, Hauser RWoldin B, Sawyer S. Chronic neck pain: making the connection between capsular ligament laxity and cervical instability. Open Orthopedic Journal. 2014; 1:326-45. 13Hauser RA, Blakemore PJ, Wang J, Steilen D. Structural basis of joint instability as cause and its successful treatment with regenerative injection therapy (Prolotherapy). The Open Pain Journal. 2014;7:9-22.